« Is this the new face of English Football? recently he has been threatening to start a government on his own(Zanu PF Party), citing that its not good for a country to go without government. Well, at the rate he is killing everything, maybe that wold be the best if the “talks” in South Africa are not yielding any results. And who in the hell though of Thabo Mbeki as the best mediator. 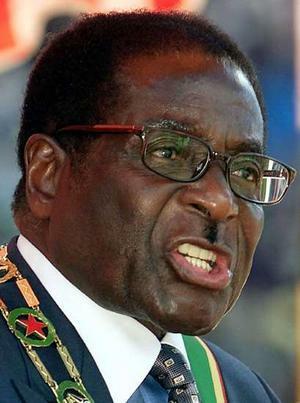 I mean isn’t it obvious to the world this dude is not planning on doing anything about Mr Mugabe (Bob). How long has it been since he was given the task, and what has been achieved – a verbal agreement on who will be president and who will be prime – minister, with struggles till on about the powers possessed by each position. This leaves more confusion into the minds of those concerned especially Zimbabweans. Or was this all just another plot from the mastermind Bob, another “Nkomo ” incident? Make the enemy believe you’re working together, and give them a little bit of power, but retain all the telling power – like being in charge of the security and having the power to appoint and dismiss ministers? Oh sir Bob – we know it will only be a month or so before all the MDC ministers are fired on “corruption” charges or “plotting to kill the president”. So Tsvangirayi has been given until end of Thursday to sign else a cabinet will be put together without his involvement. we wait…..
“Talks” that end in ultimatums – what talks. Guess this may be supporting the theory there can never be peace till sir Bob is out – totally out. The people are hungry and fed up, countries are fed up and disgusted (though some seem not to care 😦 shame innit), i mean even he (Mugabe) can see the troubles within but he still holding onto power like flies on excrete. Power sharing? Come on, this oke does not want to share power – all he is after is bringing MDC on board, so he can get the international community off his back, and get a bit of funding to fund their extravagant lifestyles…or maybe to escape to his mansion in Singapore, since maybe Zuma taking over the ANC may mean South Africa wont be on his side no-more – just MAYBE, because we all know about Zuma and his “issues” – but that’s a story for another day innit. So, sir Bob is still on as Zimbabwe’s president, still holding on for dear life. It is not that nothing can be done. It is simply because those who can help just do not care enough. He hasn’t killed enough people according to their standard before they can intervene and “remove” him from his post. Dont yall think its time something is done before another Rwanda or Darfur?